Accessing other perspectives will almost certainly involve other people. They will have their own preferred outcomes, their own ideas about what to do, and their unique viewpoint. Gaining access to this wealth of knowledge, insight and wisdom requires more of the systems thinker than a commitment to working with multiple perspectives. Unless people experience my respect, then whatever I access is not their perspective. Why do I believe this? Accessing someone else’s perspective involves attempting to appreciate the situation through their eyes. The impossibility of this task does not invalidate the attempt. Part of anyone’s perspective is the way they wish to be treated. Treating them with less respect than I would give myself thus prevents my access to their perspective. Respect involves, for example, assuming their wish to be treated as an autonomous individual who holds their opinions and preferences for good reasons. Most other assumptions will reflect stereotypes rather than autonomy as a legitimate other . To treat other people simply as sources of other perspectives or understandings is self defeating and a form of social strip-mining that prejudices later cooperation in changing the situation. This precludes such organisational phenomena as empty consultation in which a group of people are consulted about change and then find no evidence that their input influenced the outcome. The need for access to other perspectives makes it desirable to work collaboratively to improve messy situations. However diligently you have worked out the changes you want to make or however robust your system definition and your HAS diagram (explained in the book), it literally makes no sense to claim that you know what to do, if no-one else wants those changes. 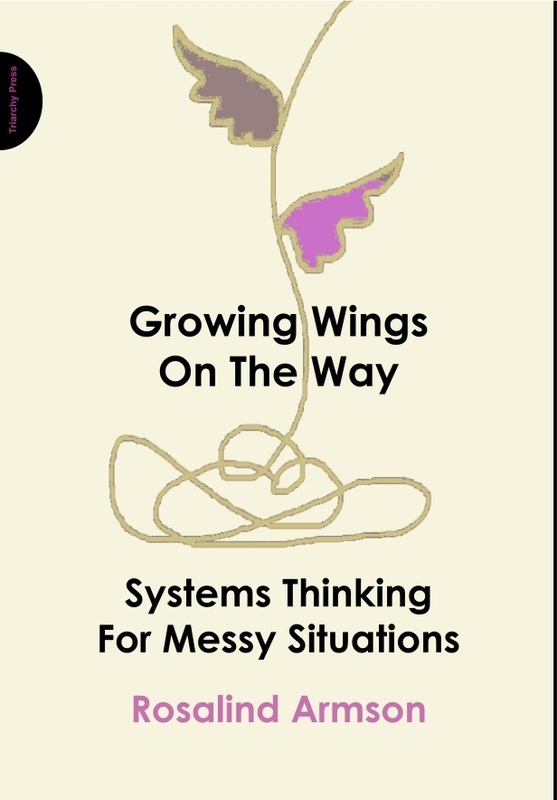 Ideally, systems thinking is a collaborative venture but must, perforce, often be done alone, especially when mess-avoiding strategies are at work. However, you have no action plan at all unless other people understand it and can accommodate it in their understandings and plans. People are autonomous and exercise their autonomy in unpredictable ways. Lewis Carroll‘s Alice’s Adventures in Wonderland (1864) has a wonderful example of this. Alice thought she had never seen such a curious croquet-ground in her life: it was all ridges and furrows: the croquet balls were live hedgehogs, and the mallets live flamingos, and the soldiers had to double themselves up and stand on their hands and feet, to make the arches. The chief difficulty Alice found at first was in managing her flamingo: she succeeded in getting its body tucked away, comfortably enough, under her arm, with its legs hanging down, but generally, just as she had got its neck nicely straightened out, and was going to give the hedgehog a blow with its head, it would twist itself round and look up in her face, with such a puzzled expression that she could not help bursting out laughing; and, when she had got its head down, and was going to begin again, it was very provoking to find that the hedgehog had unrolled itself, and was in the act of crawling away: besides all this, there was generally a ridge or a furrow in the way wherever she wanted to send the hedgehog to, and, as the doubled-up soldiers were always getting up and walking off to other parts of the ground, Alice soon came to the conclusion that it was a very difficult game indeed. The players all played at once, without waiting for turns, quarrelling all the while, and fighting for the hedgehogs; and in a very short time the Queen was in a furious passion, and went stamping about, and• shouting, "Off with his head!" or "Off with her head!" about once in a minute. People (and flamingos and hedgehogs) cannot be moved around like chess pieces as Alice’s experience clearly demonstrates. Plans that neglect the complexities of real people, their interests, diverse motivations and divergent visions of what is needed, rarely work as predicted, especially in messy situations. Managers have a choice . Some managers assume people are reluctant workers and must be compelled by a mixture of sanctions and incentives to do the job. A more effective management style seeks to engage workers with the task. People, whether employees, colleagues or allies, are more effective in creating change if they acquire an interest in that change. One of the most powerful ways of acquiring a stake in change is contributing to the change process, even if that contribution is very small. In Ellen Langer’s classic experiment, test subjects bought $1 tickets for a fictitious lottery. Experimenters then offered them the opportunity to trade their ticket. Those who had chosen their own ticket – decorated with the badges of a football team – wanted, on average, $8.57 for their ticket. Those who had simply received a random ticket wanted only $1.96. The exercise of choice had given them a stake in the outcome that was more valuable than an equal chance in a $50 lottery prize. I tell this story, not to demonstrate the ‘illusion of control’ but to show how exercising choice creates commitment to the outcome of an event. Respect means it is your responsibility to explain, not other people’s to strain to understand. Engaging others in creating change requires tact and patience, separating explanation from persuasion. Even so, in a messy situation, people will often feel stressed and suspicious. They too experience bewilderment in confronting a mess they would prefer to ignore. However carefully you explain, there is a risk that people will misunderstand and then disagree with their own misunderstandings. If this happens, do not argue. Ask people to explain what they have understood from your proposal and then correct any misunderstanding, without judgement. You can eliminate many details and resolve disagreements by creating common understanding.